When everything goes wrong with a Septum piercing - Cherry Colors - Cosmetics Heaven! As you may know, I got my septum pierced back in May. Well, to be exact, the last day of May. This means that now I had my septum pierced for almost 6 months. That's quite a lot. Septums are supposed to be quick healing piercings. As it turns out, nothing heals easily on me. Instead of 2 months of healing, mine expanded to 4 months. Ouch! I am sure it would have taken a lot longer if it weren't for some small improvements I did regarding the piercing. The first improvement was ditching the septum retainer because my septum actually got swollen and the retainer started pressing on the skin which got, of course, extra irritated and caused some bumps to form. The bumps were flesh colored, semi-hard and non-painful. They were practically hypertrophic scars. They took the longest to get away. I got a circular barbell put in at my piercer's place. I wasn't really happy with the color of the balls and when they fell off a couple of days later (because I couldn't leave them alone! ), I was very excited. The swelling got progressively less intense, but of course, I just wouldn't leave the damn piercing alone. Seriously. It's the most fun piercing to play with. Uh... But of course, you shouldn't play with piercings (except for the VCH haha). 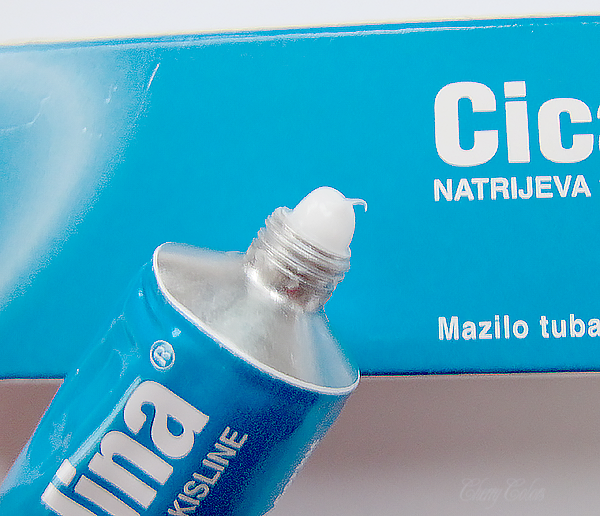 Anyway, after some thinking, I contacted my piercer and she suggested I use this cream called Cicatridina. It contains hyaluronic acid which helps promote growth, with other things too. You know, I'm not usually a fan of putting stuff on your piercings, I'm more of "let it heal on its own, with some cleaning in between", but I had a situation here. I was feeling cheap, so I didn't get it right away. I tried using my Hyaluronic serum (pure) on it, but it did absolutely nothing. After a month of status quo, I got the cream. From then on, everything went smoothly. 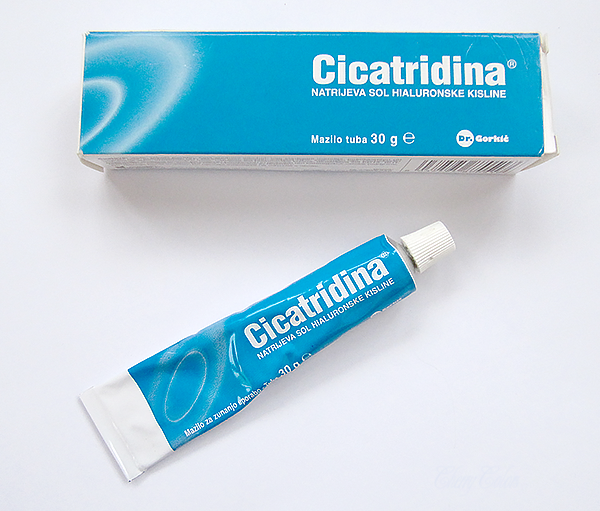 Cicatridina Ointment is indicated in the adjuvant treatment of reparative processes of superficial and deep wounds. In these cases, the aim of topical treatment is to create the favorable conditions for wound healing through the action of hyaluronic acid, a fundamental component of extracellular tissue. Hyaluronic acid, thanks to its ability to retain water contributes to an optimal performance of the biological repair process thus facilitating the cell migration and providing the suitable degree of hydration. I used the cream two times or three times per day, right after I would do my sea salt soak. I applied it with a q-tip, simply because this was the easiest way. 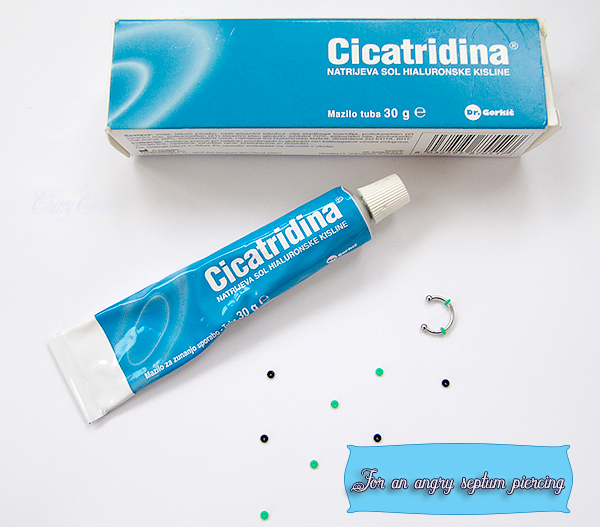 I can say it helped a lot, my piercing stopped being irritated and the scars went away. Those took two months to go away, but the irritation took less than a week. If I am not mistaken, I paid something less than 8€ in the Sanolabor store for 30ml of product. I still have 1/2 of the tube left, even if I used it every single day for the past couple of months. I decided to downsize my piercing from 1.6mm to 1.2mm because I prefer thinner looking septums (they are daintier) and also because they are easier to heal. But you know what's terrible with a circular barbell? The crusties that form on it while the piercing is still healing. Every time the piercing moves (and it moves! ), those crusties get dragged inside your healing fistula (piercing wound) and they feel like someone is dragging pieces of glass inside of it. It . Hurts. So. Damn. Much. I had to find a solution. And I had to find it quickly. Luckily Googling the subject came in handy. I found out about O-rings. 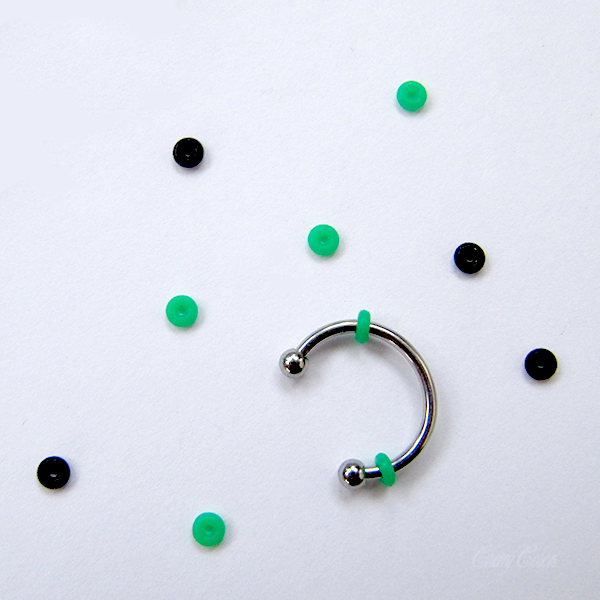 O-rings are those small rings made from rubber (or silicone), which help your piercing stay put. So it doesn't move around. This helped with my healing time a lot. A LOT. O-rings are luckily very cheap and I'm saying luckily because I keep losing them (while changing piercings). Also the barbell balls. I lost about 15 of those in my room. Never to be seen again. Those are more expensive than o-rings, tho. O-rings are about 5 cents each. You can get these made from rubber or silicone ones. I have a pair of each, and I can't tell the difference. I ordered 1.6mm/diameter of the rings and they fit perfectly on both the 1.2mm piercings and 1.6mm piercings. Oh, don't get me wrong, putting these on (while wearing the piercing) is a nightmare. Okay, it's harder putting it on a septum bullet than on a circular barbell, but still. The struggle is real. Do you have any "extra" steps in helping your piercing heal?